TOKYO, JAPAN, December 25, 2017 --- NTT DOCOMO, INC. announced today its Japan Welcome SIMTM series will introduce Plan 0 (read "plan zero") to allow overseas visitors in Japan to access the Internet for free via the DOCOMO mobile network, from December 26. The free service will initially be available in Hokkaido and Niigata prefectures, after which other areas will be added sequentially. Along with the addition of Plan 0, Japan Welcome SIM's Plan 1000 and Plan 1700 will be renamed as Plan S and Plan M respectively, and a Plan L will be newly added for large-volume users of high-speed data communications. These changes will also apply from December 26. DOCOMO has launched various fee-based plans for Japan Welcome SIM since July, but Plan 0 is the first free plan in the series. Customers can qualify for the free service by viewing designated advertisements in their home countries before visiting Japan. Plan 0 is being offered in collaboration with local governments and business partners that are interested in targeting specific foreign visitors through advertisements and by setting various conditions for service usage, such as application periods, SIM pick-up periods, SIM handover locations, total SIMs to be offered, and more. Japan Welcome SIM is provided as a 3-in-1 SIM card compatible with regular, micro and nano formats. 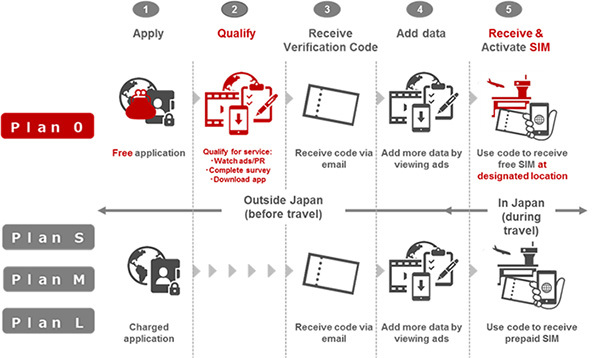 Access to the DOCOMO network is provided for 15 days under various plans --- Plan 0, Plan S, Plan M and Plan L. Plan 0 offers free Internet in exchange for viewing a certain number of video ads and completing a survey prior to arriving in Japan. Ad-free access at 128 Kbps is available for ¥1,080 (Plan S), or high-speed (max. 788 Mbps*1 ) 4G access is available with Plan M (¥1,836 for 600 MB) and Plan L (¥2,376 for 1.2 GB). Users can continue to enjoy the high-speed service by topping up their SIMs for ¥216 (100 MB), ¥756 (500 MB) or ¥1,296 (1 GB). Alternatively, the SIMs can be topped up with free high-speed data through methods such as watching video ads or completing surveys. Even after purchased high-speed data amounts have been used up, access to the network is still available at 128 Kbps for the remainder of the 15-day period. Japan Welcome SIM applications are accepted in English, Japanese, Chinese, Korean and Thai at https://docomo.prepaid-sim.jp/lp (credit card registration required). - The data rate shown is the theoretical maximum downlink speed available in certain locations throughout Japan. Access is provided on a best-effort basis and actual speeds May vary depending on the transmission environment, network traffic, and type of device used. - For information on compatible devices and other conditions of use, please visit https://docomo.prepaid-sim.jp/faq/lp and refer to the applicable FAQ section. - Prices shown include tax. DOCOMO makes stays in Japan more convenient and enjoyable by offering visiting tourists and businesspeople data communication options and a translation service that leverages artificial intelligence and other advanced technologies. DOCOMO also supports the stimulation and revitalization of regional economies through its "+d" initiatives for the creation of new value through collaboration with various partners.